MUSES considered potential synergies for multi-use, as well as the challenges encountered, through a series of 7 case studies with different thematic, geographic and focus area dimensions. Case studies undertook desk analysis and stakeholder engagement to identify barriers, opportunities, limitations and needs. representativeness of both already implemented MU cases and examples of potential MU cases. Focus Area 1 “Addressing MU”: this Focus Area analyses MUs development potentialities. It is applied both to cases where MUs of the sea are not developed yet and to cases where MUs are already in place, but actions are needed in order to fully exploit MU potential. Focus Area 2 “Boosting Blue Maritime Economy”: this Focus Area analyses those aspects of MUs strictly linked to the development of maritime economy. Main objectives here are: to highlight economic added-value of co-use of resources (infrastructures, services, personnel); to identify strategies reducing risks associated with economic development of combined uses; to promote local entrepreneurship and create context to favour job creation, broader social aspects and promote economic recovery. 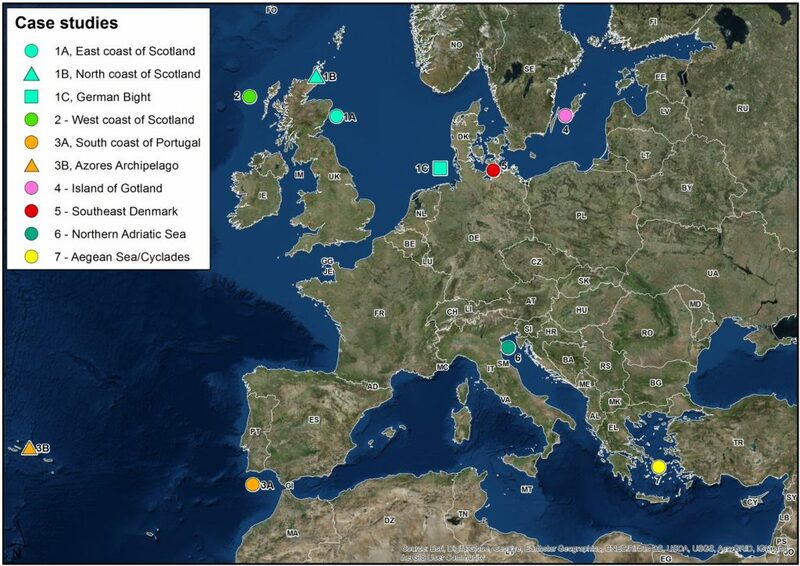 Focus Area 3 “Improving environmental compatibility”: this Focus Area analyses those aspects of MUs linked to the protection of the marine environment and/or minimization of existing impacts. Main objectives here are (different objectives may suit to different case studies): to identify solutions to concentrate marine activities in order to minimize the use of sea space; to identify positive and negative impacts of MU; to identify technical solutions to minimize environmental impacts; to identify win-win solutions triggering both socio-economic development and environmental protection (e.g. sustainable tourism and MPAs or small scale fishery/aquaculture and MPAs). The purpose of this document is to establish a common methodology for the analysis of MU at case study level, within WP3. This methodology provides case study leaders with a common approach to examine practical experience related to MU in their local contexts. Aiming at maximizing the degree of commonality between the two scales of analysis considered in the MUSES project (Sea Basin scale and local scale), this methodology incorporates some of the elements defined in the Analytical Framework (Analysing Multi-Use in the European Sea Basins) developed under WP2. The methodology described in this document is aimed at guiding the process of information and data gathering and stakeholder engagement, providing the needed degree of homogeneity to the cross-cutting analysis of the seven case studies considered by the project. The methodology should be interpreted as a flexible tool to be adapted in its details in order to meet the needs of the single case study. This can be downloaded here. The infographic below visually demonstrates the case study methodology. The purpose of this document is to describe stakeholder identification and engagement at case study level, within WP3. Actions planned by case study leaders in order to interact with stakeholders are detailed here for each local case study of the MUSES project. 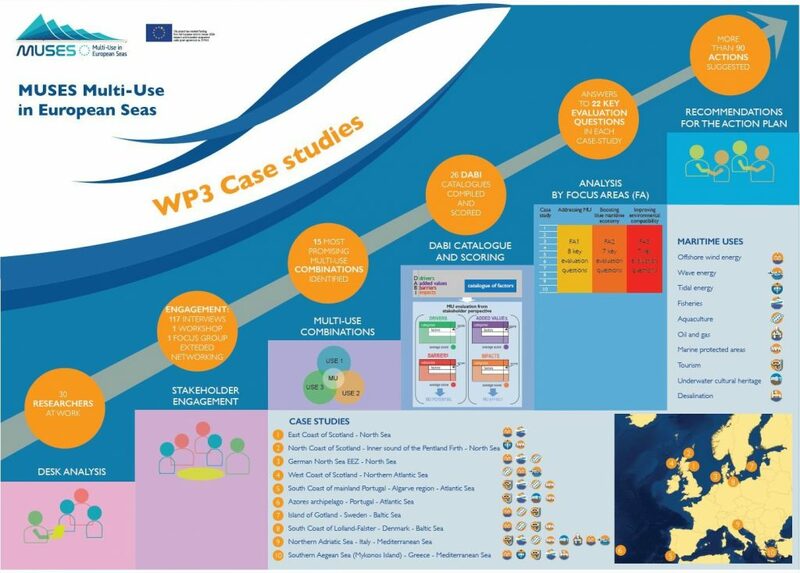 This document complements the MUSES Case study methodology deliverable where the methodological approach to WP3 is given and case studies are described in detail, considering their geographical and thematic scope and expected results. However, in order to guarantee the understanding of stakeholder role within WP3, some synthetic elements concerning WP3 activities are also provided in this document. This can be downloaded here. These documents present the results of case study implementation carried out in the framework of WP3. Case Study 7 – Marine Renewable Energy Sources & Desalination, Fishing & Tourism in the South Aegean: the case of Mykonos Island (Greece – Mediterranean Sea). In addition to the case study reports (downloadable using the links above) a short introductory report is also available to download. 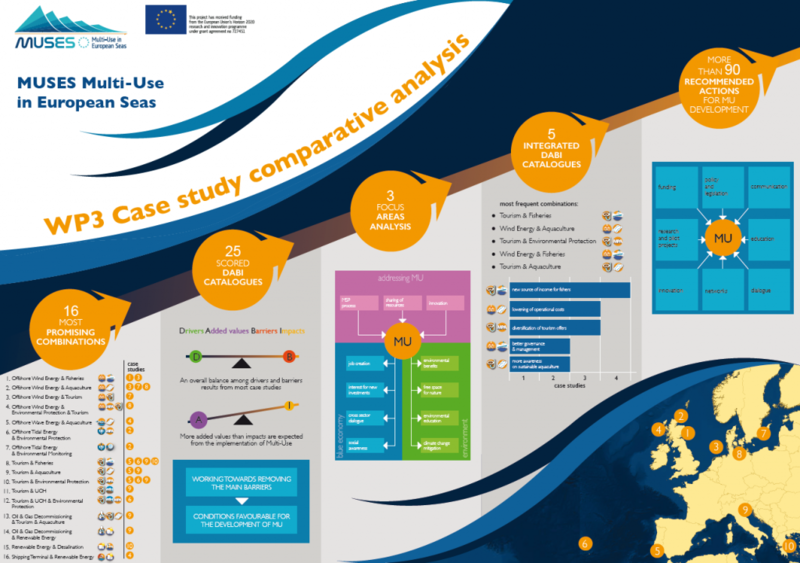 This document presents the results of the “Case study comparative analysis” carried out in the framework of the MUSES project’s WP3 and can be downloaded here: Comparative Analysis and Final Report. The infographic below provides a visual summary of the comparative analysis.